I just loaded 1.5 but the accordian seems to be totally disabled (tried both IE and Firefox recent versions). The accordian has no blue “header” just Recent Comments text. Ok, thanks for that info Dale, I will take a look at it. 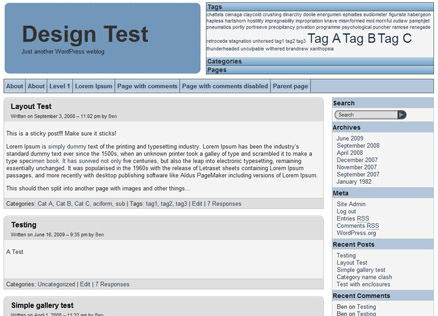 Does the test page at http://designtest.techgremlin.com/?theme=Whispy+Blue work for you? 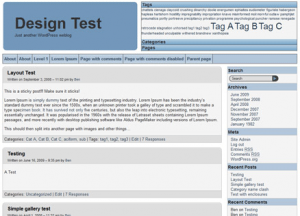 What happens when you try to add widgets? The Accordion uses the bottom 3 widget panels in the admin section. Ok I think I have figured out why it may not be working for you, it appears you may be running an old version of WordPress, or it hasn’t been upgraded properly in the past, as 2 of the built in features required for the Accordion to work are quite old versions, I have created a special version of the theme that you can download here that contains it’s own new versions of the files, it should work then. I highly recommend updating to the latest version of WordPress if you can as there are a few security issues with some of the older versions.